I’ve been writing for two and a half years now, but a Madrid-shaped hole on this blog has been growing bigger and bigger ever since I first landed at Madrid-Barajas airport in September 2012. I’ve never really done a proper “city trip” to Madrid in my time here because it’s always been a convenient bookend for flights to and from the States. Consequently, I’ve never felt the need to put together a blog post about the Spanish capital—until now. Approximately half a dozen mini trips to Madrid later, I feel like I’ve gotten a chance to get a true feel for this capital city and finally seen all the museums I’ve wanted to visit. And since my family is coming to visit me for Christmas, I think I ought to distill my impressions and tidbits into something I can share with them while I’m their unofficial tour guide for the week. I’ll be up front with y’all right now: Madrid is not my favorite city in this country. Give me extroverted, Moorish-influenced Sevilla or Córdoba; subdued, Old Spain outposts like León, Zamora, or Teruel; or my charming adopted hometowns of Úbeda or Santiago de Compostela. Madrid is far too huge, loud, and expensive for my tastes, and this introvert can only take the capital in small doses every couple of months. But there’s something about this city-that-never-sleeps that keeps calling me back (perhaps it’s the nonrefundable round-trip plane tickets, but I digress). 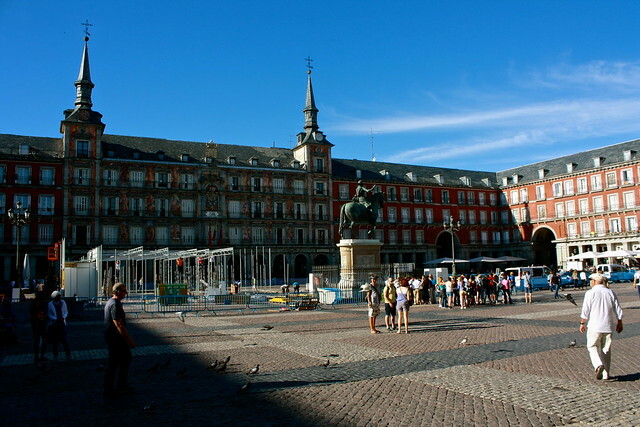 Madrid has only been the country’s capital since 1561, when King Felipe II moved the royal court from northerly Valladolid south to what was then a village of 30,000. But what la Villa de Madrid lacks in awe-inspiring monuments, it makes up with a contagious joie de vivre that the sleepy pueblos and workaday provincial capitals fail to exude. I love the buzzing energy I feel walking around town as the sun is rising or the warm merriment that pours out of a jam-packed restaurant at night. Madrid tiene vida. That’s not to say there’s nothing to check off your hitlist in town; on the contrary, Madrid has a lot to see and do. In this post, I’d like to highlight some of the biggest tourist draws to the capital of Spain. I’m fully aware that this is nothing original; however, countless folks pass through here every year and completely miss half of what I’m about to talk about—so take note! 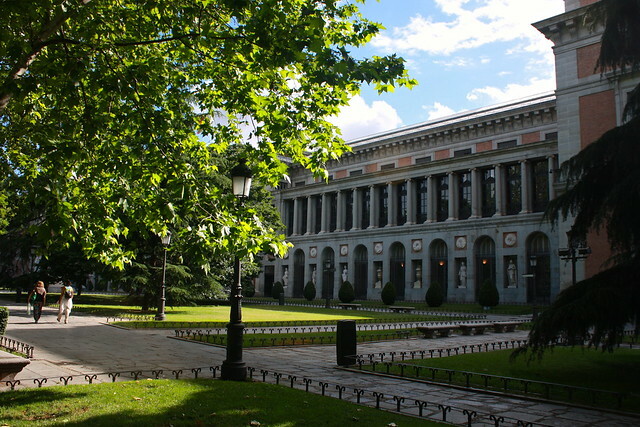 I would be remiss if I didn’t put the Museo Nacional del Prado first on this list. Considered to be the greatest collection of European masters anywhere, the Prado Museum is also the best place to see paintings by famous Spanish artists like El Greco, Diego Velázquez, and Francisco de Goya. Come for Velázquez’s huge, complex masterpiece, Las Meninas, stay for the emotive, haunting paintings of Goya, and linger over fine Renaissance works by Italian and Flemish artists. I try to stay away from “must-see” recommendations on this blog, but you absolutely can’t come to Madrid and miss the Prado. After all, it’s free after 6pm! At the southern vertex of Madrid’s “Golden Triangle of Art” is the Reina Sofía Museum. Open to the public since 1992, it was named for Queen Sofía (wife to King Juan Carlos I) and fills a former hospital from the 1700s near the Atocha train station. Essentially, the Reina Sofía picks up where the Prado leaves off—the visual arts of the 20th century—and is a great way to appreciate paintings by such Spanish artists as Pablo Picasso, Salvador Dalí, and Joan Miró. 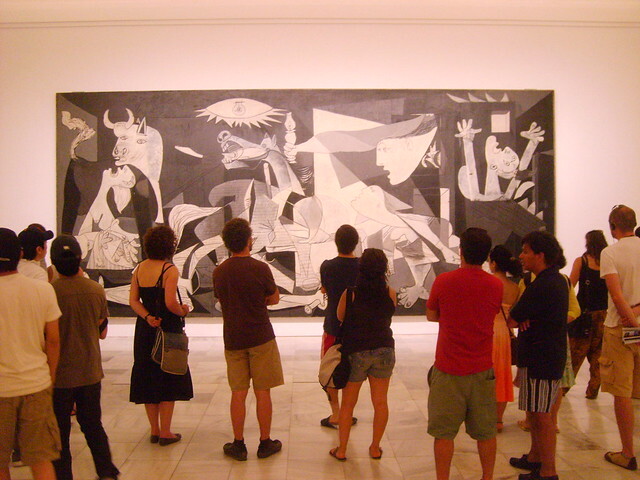 The museum’s most famous work is Picasso’s masterpiece, Guernica, which depicts the senseless bombing of a Basque village by German aircraft in the Spanish Civil War. The Thyssen-Bornemisza Museum caps off the Golden Triangle and is across the street from the Prado. Pronounced “TEE-sin,” it opened the same year as the Reina Sofía to exhibit the world’s second-largest private collection of art. I’ve heard it described as “major works from minor artists and minor works from major artists,” spanning centuries of European and American art. If you’re a completionist like me, it’s worth exploring, but don’t go out of your way to check it out. One of my personal favorites is the National Archaeological Museum, north of the Prado along the Paseo de Recoletos. Closed for renovations for almost a decade, it recently re-opened in April and shows off priceless artifacts from prehistory down to medieval times in fresh, modern displays with Spanish and English descriptions. 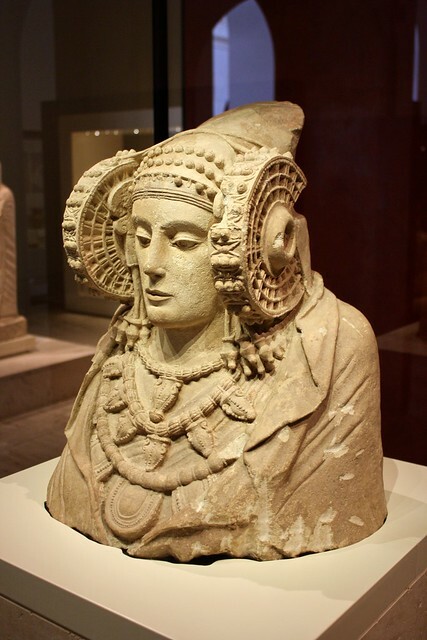 Some of the museum’s treasures include the Dama de Elche, an enigmatic bust of a pre-Roman woman, and the Hoard of Guarrazar, a set of gold Visigothic votive crowns that would have hung over church altars in the Dark Ages. 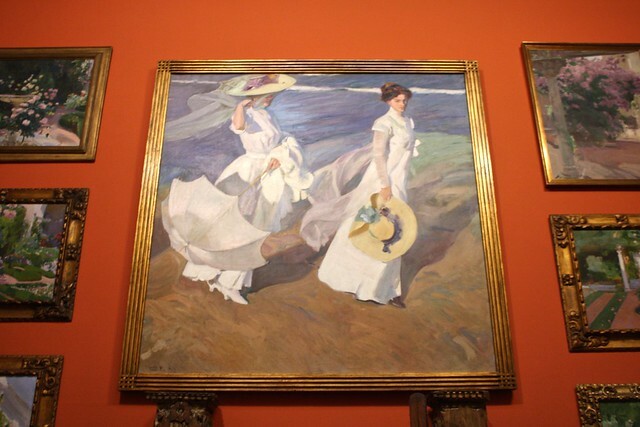 If you’re itching to check off more museums off your list, I can’t recommend the Sorolla Museum highly enough. Based in Impressionist painter Joaquín Sorolla’s former home, it showcases hundreds of his paintings that effortlessly capture light and emotion. The Museum of the Americas (Museo de América, singular, in Spanish) occupies an imposing building in the neighborhood of Moncloa and retraces the history and culture of North and South America from pre-Colombian times to the Spanish Empire. And the Naval Museum holds a small but fairly interesting collection of maritime artifacts dating back to the 1500s, including maps, nautical instruments, flags, and lots of ship models. The defeat of the Spanish Armada in 1588 is kindly skipped over. The Madrid we know today has only been around for around five hundred years, so aside from a dozen Baroque or Neoclassical churches, the city isn’t as monumental as, say, Toledo. Nevertheless, the city’s Royal Palace (Palacio Real) can be counted among the great Baroque palaces of Europe. When Madrid’s old alcázar or castle burned to the ground in 1734, King Felipe V took advantage of the opportunity to construct a new royal residence along the lines of France’s Palace of Versailles. Philippe was, after all, the first monarch of Spain’s new French Bourbon dynasty and actually grew up in Versailles itself. 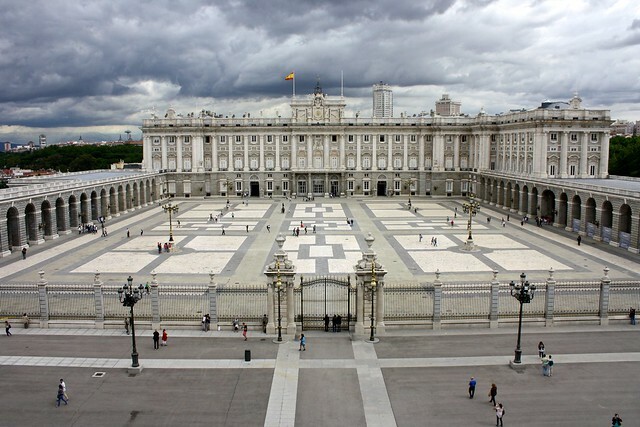 The current king, Felipe VI, and his family live in the Palacio de la Zarzuela, using the Royal Palace only for official state receptions and functions. It’s a marvel of gold leaf, fancy porcelain, and countless frescoes and couches. Facing the palace on the south side of the square is the Almudena Cathedral, designed in a pleasant combination of Gothic and Classical Revival styles that tie together well with the similarly blue and gray palace. While a cathedral was originally planned to be built here in the 16th century, it wasn’t until 1879 that construction finally began, finishing in 1993. 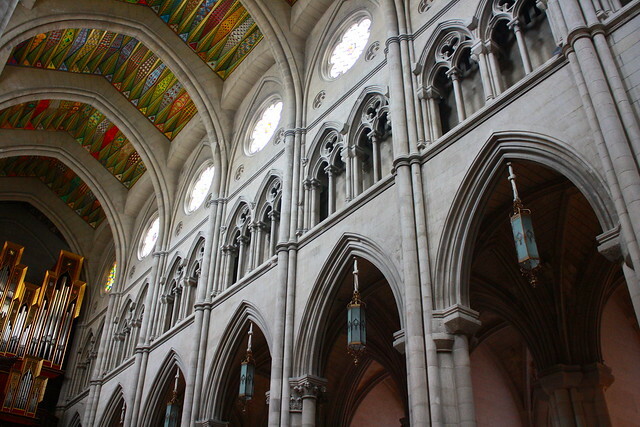 The colorful, modern ceiling in the neo-Gothic interior is a refreshing change of pace, and contemporary-style stained glass covers the windows in the apse and central nave. The name “almudena” refers to an image of the Virgin Mary, supposedly hidden for centuries in the old city walls of Muslim Madrid, which was discovered when Castilian troops conquered the citadel or al-mudayna in the 1000s. Madrid’s most impressive church, however, can be found a short five-minute walk south from the cathedral: the Church of San Francisco el Grande. 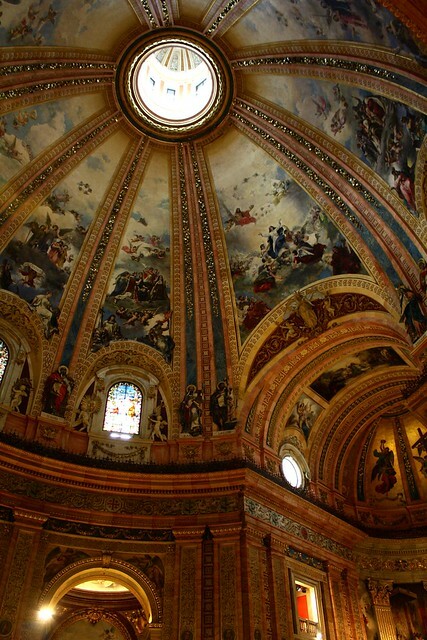 Although it belongs to a Franciscan monastery, the church’s interior is sumptuously decorated in gold leaf, frescoes, and many varieties of colorful stone. The dome itself is Christendom’s third largest and creates the same feeling of grandeur and awe that you get when you walk into Rome’s Pantheon, for example. There are even a few paintings by Zurbarán and Goya hanging on the walls. Sitting at the intersection of the historic center, the posh Salamanca neighborhood, and Retiro Park, Madrid’s town hall is a gleaming white Modernista building finished in 1919. 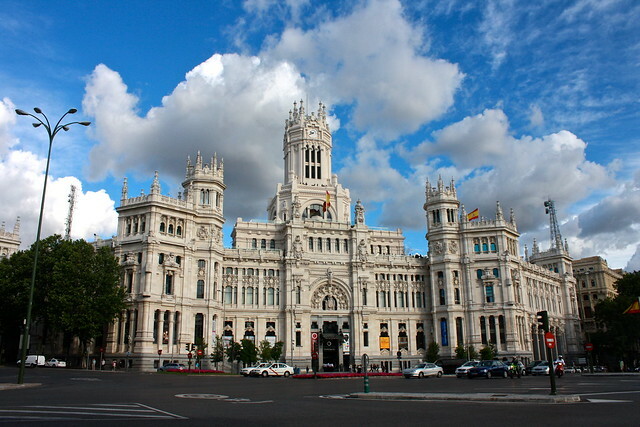 Officially the Palacio de Cibeles, it was the seat of the national postal service until the ayuntamiento or town council moved here in 2007. 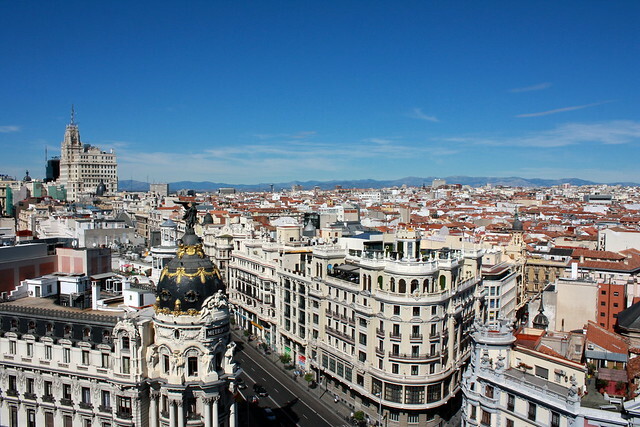 It’s definitely worth splurging to ride the elevator to the top of the central tower where there is a small, wraparound terrace with great views of central Madrid. 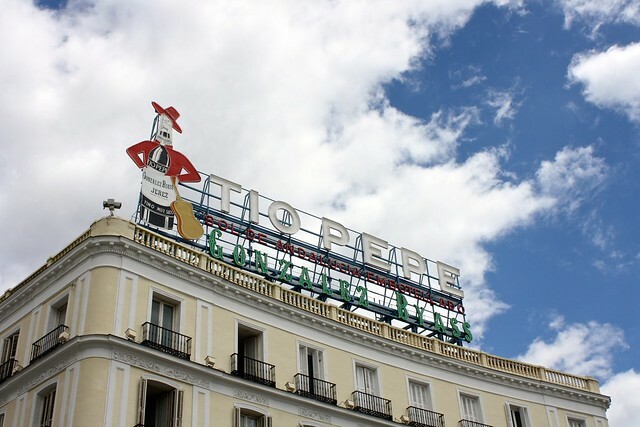 Puerta del Sol, however, is the beating heart of the 21st century’s loud and proud Madrid. Called the “Sun Gate” because it once guarded the eastern walls of a much smaller Madrid, it can be thought of as Spain’s Times Square—not only because nine streets converge here but also because this is where Spaniards wait on New Year’s Eve to listen for the twelve bell tolls from the Casa de Correos…and where they try to scarf down one green grape for each chime at midnight. Puerta del Sol is also the place people go to protest government policies, and folks even set up camp here during the indignados movement that began in May 2011. 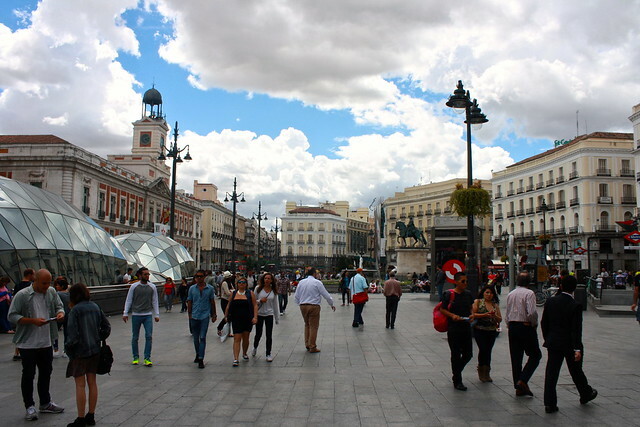 A major hub for the city’s metro and cercanías commuter rail services, Puerta del Sol also marks Kilometer Zero, which the country’s six major radial highways head out from. To the northwest of Retiro Park swirls a large, busy roundabout called the Plaza de Cibeles. A neoclassical sculpture of the Greek goddess Cybele commands the center of this square circle, and when Real Madrid (or the Spanish national soccer team) have major wins, the city floods into this plaza to celebrate in the shadow of Cybele’s chariot. Deep in the heart of la Madrid de los Austrias—the western, older half of downtown—you can find the historic Plaza de la Villa. On one side is the Lujanes House, a Gothic-Mudéjar residence that once belonged to royal officials. The Cisneros House is a fine Renaissance palace that is connected to the Casa de la Villa by an arched passageway. A Spanish baroque palace with typical pointy slate-tiled roofs, the Casa de la Villa served as Madrid’s town hall for 314 years. 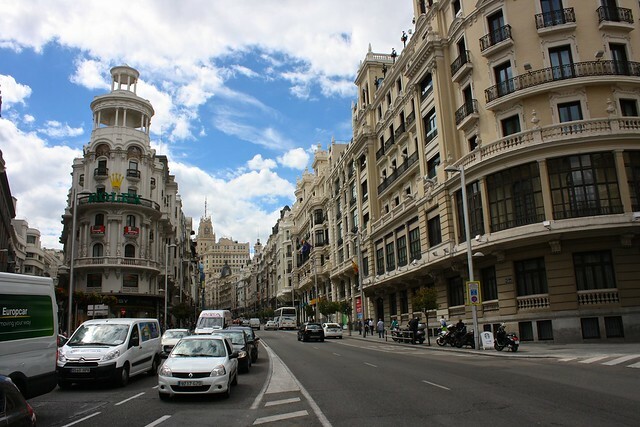 Gran Vía is the grandest avenue in the country, and it traces a northwesterly path from the Plaza de Cibeles up to Plaza de España. It’s only existed for a hundred or so years (countless city blocks were torn down to pave the “Great Way”) but in that time some really special gems of early 20th-century architecture went up and Gran Vía became the Broadway of Spain. If Puerta del Sol is Madrid’s Time Square, and Gran Vía is its Broadway, then the Parque del Buen Retiro is its Central Park. A gigantic city park equal to half the size of the old town, the “Nice Retreat Park” originated as a private royal sanctuary that was opened to the public in 1868. A mix of wild forests and manicured tree-lined avenues, Retiro Park is the place to go for a paseo (afternoon stroll), early morning jog, or group roller-blading. You can also go row-boating in the lake in front of the Monument to Alfonso XII, and the Palacio de Cristal (“Palace of Glass”) is magical at sunset. 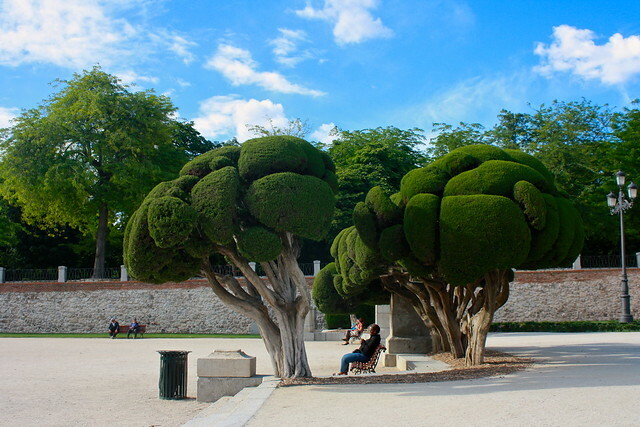 Snuggled in between Retiro and the Prado Museum are the Royal Botanical Gardens. A tightly-curated selection of thousands of plant and flower species from around the world, the gardens are arranged in neat grids between three terrazas or stair-stepped levels. Although there’s a small entrance fee to get in, in my opinion the Real Jardín Botánico is a much more relaxing and peaceful place than Retiro. One of my favorite places in the whole city can be found on a lonely wooded hilltop northwest of the Royal Palace. The Templo de Debod consists of an ancient Egyptian temple and two eerie gateways that were donated by Egypt in gratitude for the Spanish government’s assistance in moving several temples in danger of flooding by the Aswan High Dam. 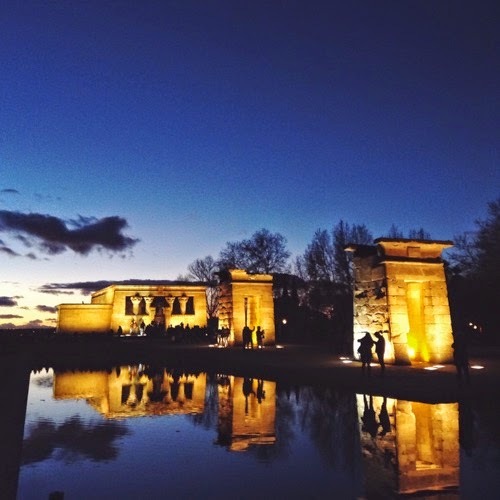 Come here during the Blue Hour, right after they turn on the floodlights, when the Temple of Debod is at its most bewitching. 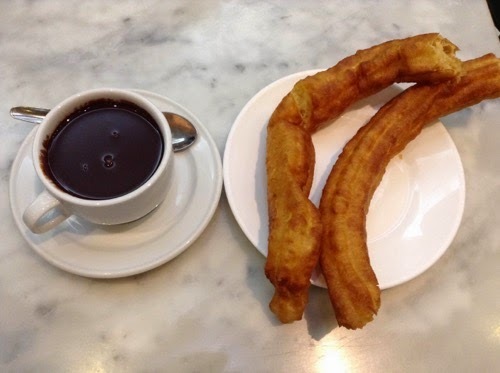 Open for business since 1894, Chocolatería San Ginés serves up the country’s finest chocolate con churros—skinny, fluted fried dough paired with thick, hot chocolate. You can also order chocolate con porras, which come with larger, puffier pastries to dip in the chocolate with. It’s open 24 hours a day, but you’ve got to find the shaded passageway it hides out in first before you can take part in what has become a true Madrid institution. If you visit during winter, make sure to order either callos a la madrileña—Madrid-style tripe stew—or cocido madrileño, Madrid-style cocido: chickpea-veggie-meat stew. The winter weather can get surprisingly cold despite the sunshine, so a hearty bowl of either of these stews will warm you right up. Madrid’s excellent collection of modern markets (with plenty of tables and seating) combine the excitement of street food with the relaxed, little-bit-of-everything atmosphere of going out for tapas. You can go from stand to stand and pick up a whole tortilla here, a platter of jamón ibérico there, some fresh artisanal bread at one shop, and a glass of local wine at another and call it a night. Many places have creative takes on old favorites like watermelon gazpacho or Spanish attempts at American cupcakes. Check in to the Mercado de San Miguel near Plaza Mayor, Mercado de San Ildefonso off of Calle de Fuencarral, or Mercado de San Antón in Chueca. For the best views in the whole city, you can’t beat paying a couple euros to ride the elevator to the top of the Círculo de Bellas Artes. A fancy, need-to-make-reservations restaurant occupies this cultural center’s rooftop azotea or terrace, but you can also just get an overpriced coffee or drink from the bar and relax on a sunny afternoon here in true Spanish fashion. There is so much more to this capital city than just the touristy things, although the big sights are certainly amazing. 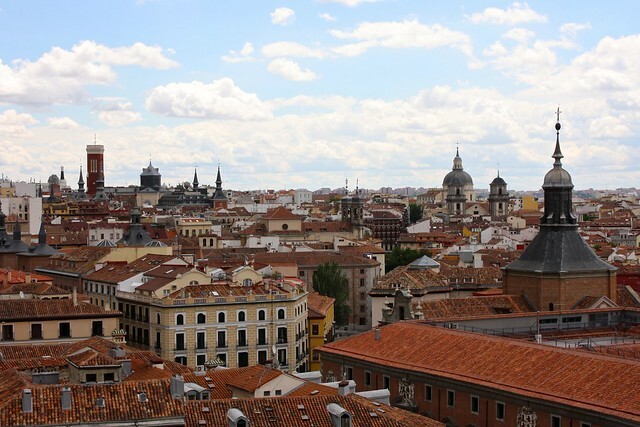 Madrid is one of the most truly alive cities I’ve been to, and my blogger friend Julia Golden beautifully describes what daily life is like here in one of her posts. What do you think are the essentials or “must-sees” in Madrid? What sort of non-touristy places or experiences give Madrid its soul? Comment below! For more pictures, check out my albums on Flickr here, here, here, and here.